When it comes to green cleaning, there are two ingredients that we all love. Vinegar and baking soda are extremely powerful and also very inexpensive. You can clean your counter tops, toilet, and all of your appliances with them. Lets be honest, there isn’t much these two can’t do. We know they are amazing, but do you ever wonder what makes them so green and so effective? Keep reading for a brief explanation of both these products. Baking soda comes from a box, right? Well yes…but how did it get in the box? A lot of science goes into making such a useful product. 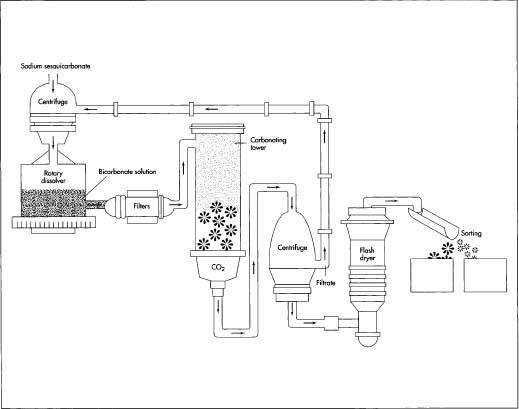 To keep it simple, sodium bicarbonate is created by separating soda ash in a centrifuge, introducing carbon dioxide, and processing it through a series of filters. Simple, right? Enotes.com provides this diagram to see exactly how the process works. We are not all scientists, but at least we know a little more about where baking soda comes from. Some people love the smell and some people hate it, but everyone knows how useful it is. Vinegar is produced from various fruits by two biological processes. The first process is called alcoholic fermentation, which happens when yeast changes sugars into alcohol. The other process uses bacteria to change the alcohol into acetic acid. Although acetic acid is a main ingredient in vinegar, they are not the same thing. Vinegar also contains many vitamins, minerals, and salts from the primary source. If you ever want to know ANYTHING about vinegar, check out The Vinegar Institute’s website…they’ve got it all! So there you have it! A brief explanation of how two of the best green cleaners are made. Please feel free to share your thoughts and ideas about eco-friendly cleaning.